Dwango’s latest ringtone offering leaves one to wonder what practical purpose it serves. We know people simple adore their dogs. Some even go as far as to buy designer dog houses for their special friends. Dwango hopes that those same people will also feel its necessary to have a mobile ringtone that only their dogs can hear. 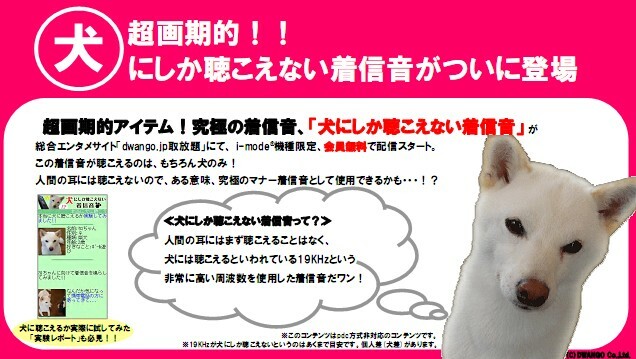 The service is called Inu ni shika kikoenai chakushinon, which means ringones only dogs can hear. Luckily the ringtones are free if you are a DoCoMo i-mode subscriber. I can’t see someone actually paying for the ringones alone. Dogs like barking for no apperant reason, and now Dwango just gave them one more unnecessary thing to bark at.